I was ambling around this afternoon in the temple town of Tirumala; with nothing significant to accomplish and with at least a couple of hours to kill, all by myself. With my camera in tow I therefore decided to do what most visitors to God’s little town would not do. I planned to walk through the town and see if I could get anything interesting to snap. My walk took me to a point where a street led away from the town and which according to the GPS was Tirumala Outer Ring Road. A ring road that went around the town promised some quietitude, a welcome departure from the hustle of a temple town. So I took this amazing tree lined road and it brought me to the bottom of a hill with six huge windmills on top of it. From a certain section of the road two of the windmills were just about superimposed over one another. 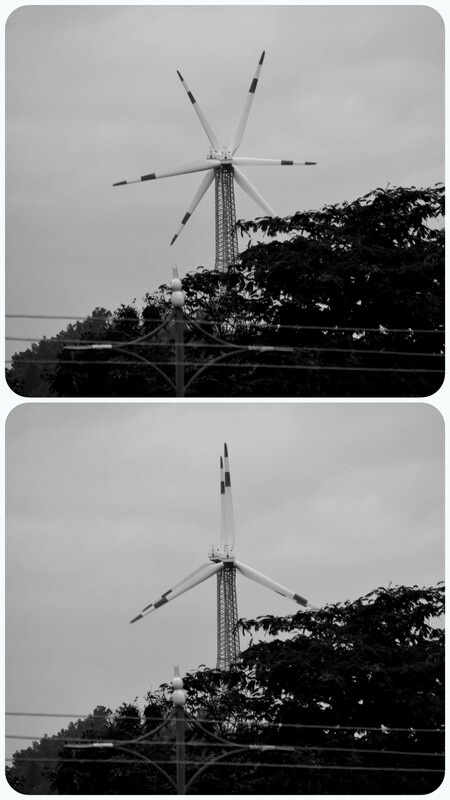 While the hands of both the mills charted their well rounded paths, they did so at different speeds, so that I got the opportunity to click these two photographs. The two pictures remind me of a chemistry lesson learnt a long time back in college. It was about conformational flexibility of an Ethane (C2H6) molecule. With the C-C bond capable of rotating about its own axis, an Ethane molecule may have a large number of possible conformers out of which the two most important ones are the ‘staggered’ form similar to the picture on top and ‘eclipsed’ form similar to the picture at the bottom. The staggered conformation is energetically the most stable and hence the most abundant while the eclipsed conformation is the highest energy form and least abundant. The first thing however, that came to my mind as soon as I saw the windmills on top of the hills, was the Sydney Sheldon novel “Windmills of the Gods”. And here I am in God’s own town, the pilgrimage of all pilgrimages, staring at six huge windmills looking down from the top of the hill. So I named them as the Windmills of the Gods.